In the last few years, the bicycle has changed from a mere object of utility to a weight-optimized lifestyle object. Not least the electrification has contributed significantly to this trend. Customers want as quiet a run as possible. The excessive background noise of the bicycle chain on the e-bike is a thorn in the side of every passionate rider. A metal sprocket acts as a deflection pulley on the chain to prevent it from colliding with the frame. And here the metal sprocket makes immense running noises. igus® has dedicated itself to making the bicycle run as quietly as possible. With the 3D printing service, the disturbing part was reprinted, but this time from the high-performance plastic iglidur® I3. The chain wheels have now been in use for two months in two wheels – and the background noise is clearly minimized. 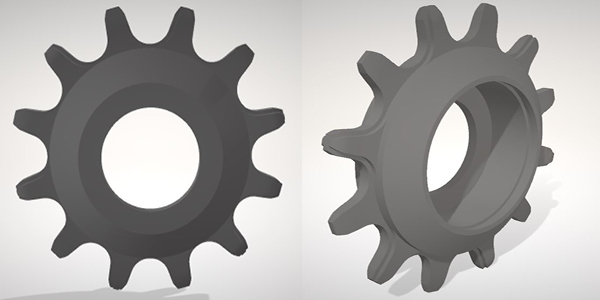 3D model of sprocket for e-bikes. 3D model of a chain wheel for e-bikes. The model was then uploaded to the print service as a step file and printed. With 3D printing, igus® offers the optimum solution for printing individually manufactured drive elements such as sprockets made of high-performance plastics. The special solutions are not only lubricant- and maintenance-free, but also reduce the noise level at the same time. If you have similar problems with excessive noise in your e-bike, please feel free to contact us via e-mail de-3D-printing@igus.net .